Just in time for Easter, this little pup is wearing the perfect shades for the occasion! This Golden is painted in acrylics on a mini wrapped 4” square canvas, and is sealed for protection. An easel is included with your purchase for display. The canvas and the easel will be shipped in a padded mailing envelope. EGGCELENT! including the easel is $30.00, plus $3.50 shipping in the U.S. SOLD! one piece from any of my selections this month, and every month! Here’s a ginger kitty, getting into the spirit of spring! She’s wearing her bunny hat! She’s painted in acrylics on a mini wrapped 4” square canvas, and is sealed for protection. An easel is included with your purchase for display. The canvas and the easel will be shipped in a padded mailing envelope. 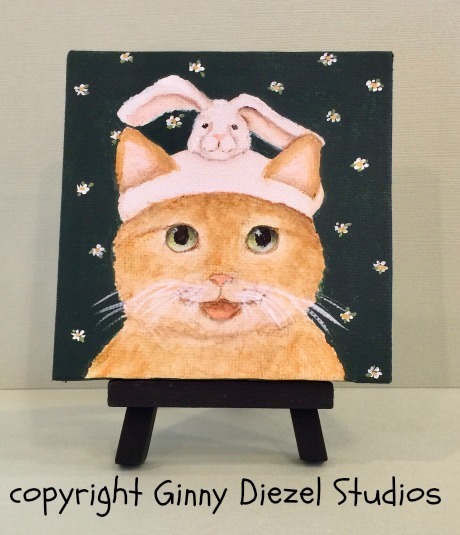 BUNNY HAT KITTY including easel is $30.00, plus $3.50 shipping in the USA. SOLD! 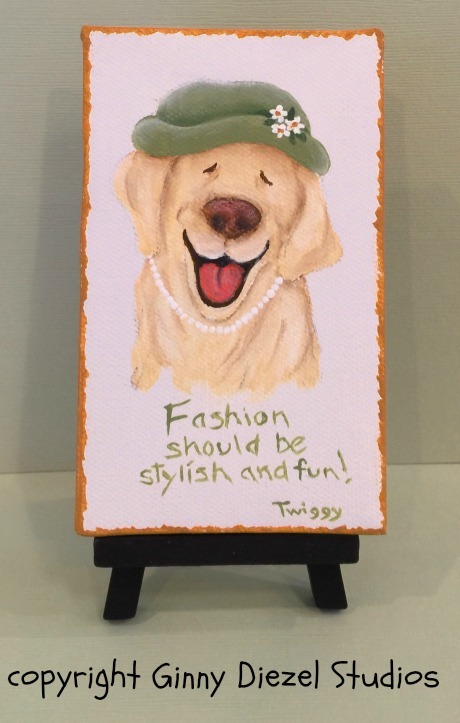 Dressed in pearls and a stylish hat, this Spring fashion dawg is ready! Note the quote from Twiggy: Fashion should be stylish and fun! This sweetie is painted in acrylics on a 3” x 5” mini wrapped canvas, and is sealed for protection. An easel is included with your purchase for display. The canvas and easel will be shipped in a padded mailing envelope. 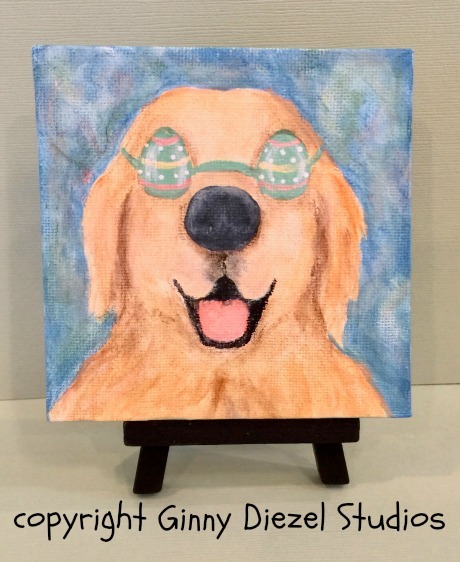 SPRING FASHION DAWG, including easel, is $30.00, plus $3.50 shipping in the USA SOLD! If you would like to purchase more than one piece, please contact me. Mother’s Day is next month. Don’t forget to kiss your Mama! This sweet scene illustrates the message perfectly. 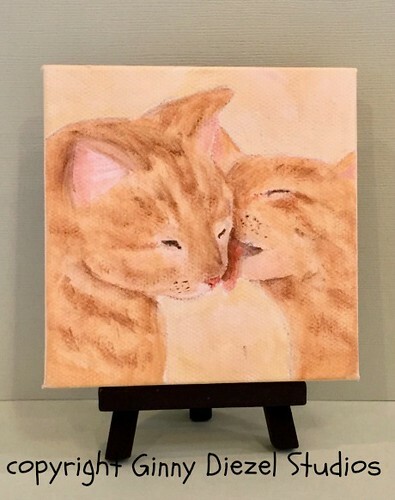 It is painted in acrylics on a 4” square mini wrapped canvas, and is sealed for protection. An easel is included with your purchase for display. The canvas and the easel will be shipped in a padded mailing envelope. KISS YOUR MAMA! including easel is $33.00, plus $3.50 shipping in the U.S. SOLD! like to see a lot of images of my work, please visit My Flickr Site. Thank you for looking, and please come back often! There are always new goodies in the works! And, if you would like to be on my mailing list for e-newsletters, just drop me a line, and tell me that you would like to be added to my list. You have the opportunity to see pieces first hand! Yippee!